Published: March 5, 2014 at 09:32 a.m. 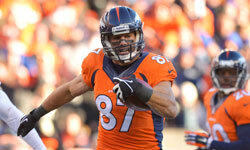 Updated: March 5, 2014 at 08:32 p.m.
Eric Decker is Around The League's top-ranked wide receiver in free agency, but even he acknowledges he was never the best of Peyton Manning's options on the Denver Broncos. "I think Demaryius Thomas is on a complete different level with his talent," Decker said Monday, via The Denver Post. "I think he's a top five-caliber receiver in this league. How it falls off from there, where you look at a receiver, I just try to be versatile and play all the positions. People might want to label me, but I don't want to put a label on myself." Observers and analysts have been sticking labels on Decker since NFL Media Insider Ian Rapoport reported last month that the Broncos and general manager John Elway view him as a No. 2 receiver who will likely be paid as a legitimate No. 1. "I respect (Elway's) decision," Decker said. "Obviously, he has a philosophy in the way he does business. We'll see what it brings." Decker clearly is ready to test his market value, telling The Post that he's "anxious about what lies ahead" and getting "ready for the next chapter in my life." He's expected to land a contract in the neighborhood of $8 million to $9 million annually. Although Decker concedes that playing with Manning has provided more targets and opportunities, he's also comfortable with the knowledge that he has produced with Kyle Orton and Tim Tebow under center. Rivaling Roddy White and Alshon Jeffery as the best second fiddle in the league, Decker boasts more touchdowns (32) than any wide receiver save Calvin Johnson and Dez Bryant over the past three seasons. Decker might not be on Thomas' level, but he's a safe investment as long as he's not getting paid to beat double teams and tilt the field as a "go-to" No. 1 receiver.